WASHINGTON (CNN) -- For the fifth time this year, a U.S. Air Force nuclear weapons unit failed an inspection, this time because of failure to document its handling of nuclear missiles and other critical issues, Air Force officials said. 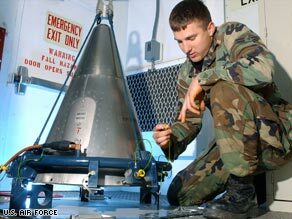 In an Air Force file photo, an airman inspects a missile part at a training site. A "nuclear surety inspection" and "unit compliance inspection" was conducted this month on the 90th Missile Wing at F.E. Warren Air Force Base in Wyoming by an Air Force inspector general. There was no risk to the unit's Minuteman III nuclear missiles, Air Force officials said. The unit has 90 days to correct the problems and pass another inspection. In the wake of recent problems, Defense Secretary Robert Gates and top Air Force officials have indicated a zero tolerance for failing inspections, but no punishments are expected in this case, officials said. The inspection report found the maintenance unit failed to document tests conducted on missiles correctly, including tests on safety devices. The inspector general told the unit the failures indicated either a "lack of competence" or "disregard for procedures," according to a source who has seen the report. Additionally, failures included having some personnel on duty without proper medical clearance and failure to inspect radiation detectors. Other units that failed inspections this year included two bomb wings and two missile units.